This article documents an unobtrusive antenna for operation on 7MHz, primarily for contacts with stations at up to 1000Km range. For this reason, no effort is made to keep the major lobe low in angle, indeed the path angles from Canberra to Sydney and Melbourne are typically 65 and 47 degrees. The design is a nominal half wave dipole, fed with nominally a half wave of open wire feeder and a 1:1 balun at the transceiver. 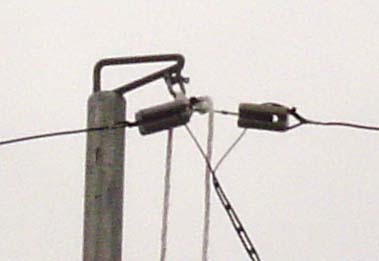 The approach was to cut the dipole legs to exactly 95% of the free space wavelength, and tune for zero reactance by trimming the length of the feedline. Being low to the ground and with slightly sloping legs, the antenna is almost omni directional, the variation in gain with azimuth at an elevation of 55deg is less than 2dB. 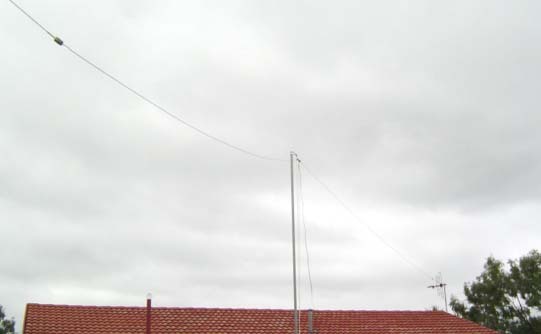 The 7MHz dipole overall, looking westwards. The dipole elements are 2.5sqmm (7 strand) black building wire (annealed copper), with glazed ceramic insulators. The central mast is 40mm NB medium grade galvanised water pipe. It is fixed to the pergola rafter using a clamp fabricated from half of a scaffold swivel and a mild steel plate. The base of the pipe sits over a steel locating pin drilled into the concrete paving. The top of the mast has a small gibbet inserted in the top, with a stainless / plastic pulley block and 6mm halyard to raise the antenna conveniently from ground level. 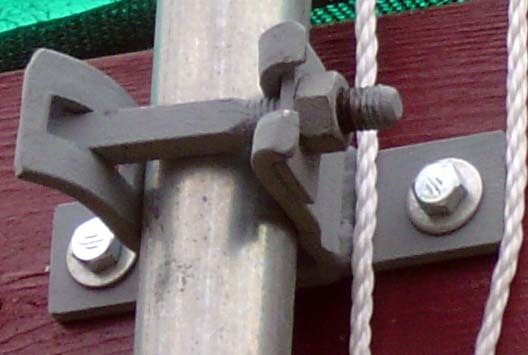 A nylon cleat is fixed to a timber column near the mast to secure the halyard. The gibbet serves to hold the antenna and feedline away from the metallic mast. The insulators are joined by a short length of 2mm galvanised FSWR with swaged eye splices. NEC modelled pattern at 55deg elevation shows nearly omni characteristic. The dipole is fed with a nominally half wave 300ohm TV ribbon feeder and a 1:1 transformer balun at the radio. The length of the feedline was trimmed to obtain system resonance (ie no reactance) at 7.1MHz. Bandwidth for VSWR=1.5 was 7.025MHz to 7.190MHz. Measurements at the unbalanced side of the balun with a MFJ 259B analyser indicated a resistance of 59 ohms at system resonance, which reconciles with the NEC model. ATU Antenna Tuning Unit - in this context, a device for transforming the impedance presented at the transmitter end of the transmission line to a load impedance to suit the transmitter. Balun Balanced - Unbalanced - a device for transitioning between balanced and unbalanced transmission line, may take many forms.